When was the last time you saw an ad for ice? Not an ice machine, or an ice cold beverage, just ice. What Three-letter Word Chills Beverages Without Killing the Taste? If you’ve ever been served a beverage filled with cloudy, fast-melting ice cubes and tasting faintly of yesterday’s broccoli, you know why really smart hosts and hostesses use nothing but genuine ice. For genuine ice—the kind made only by your Ice Company—is not only hard-frozen and crystal-clear but as completely taste-free as the purest water. It is inexpensive to buy—convenient and wonderful to use. The next time you plan a party, be sure to have plenty of genuine ice on hand to ensure its success. Your Ice Company will gladly supply your needs. NATIONAL ASSOCIATION OF ICE INDUSTRIES Dept. SA, 1706 L Street, N.W., Washington 6, D. C.
Use crushed ice generously in serving appetizers, juices, sea-foods and salads. Your Ice Company can supply genuine ice for every occasion. Get your money’s worth when you buy vegetables! Up-to-date stores always keep their vegetables garden-fresh by displaying them in crushed ice. Old-fashioned, velvety ice cream made with genuine ice in a home freezer has a texture and flavor no “still-frozen” substitute can equal. Send a postcard today for your free copy of “Money-saving Tips on Marketing”— a complete guide to buying vegetables, poultry, sea-food. Picnic time calls for genuine ice and plenty of it. A handy picnic chest carries the ice— and the beverages—and keeps the foods fresh besides. Inexpensive, too. Get one from your local Ice Company. Genuine ice, because homemade is fake! Well into the 40’s, much of the ice delivered to homes was harvested in the winter from frozen lakes and rivers, and was not safe to put in food or beverages. So I can see how an ad campaign by industry reps would be useful – similar to the “Beef, it’s whats for dinner”, or “Milk does a body good” campaigns of recent years. I don’t think so. 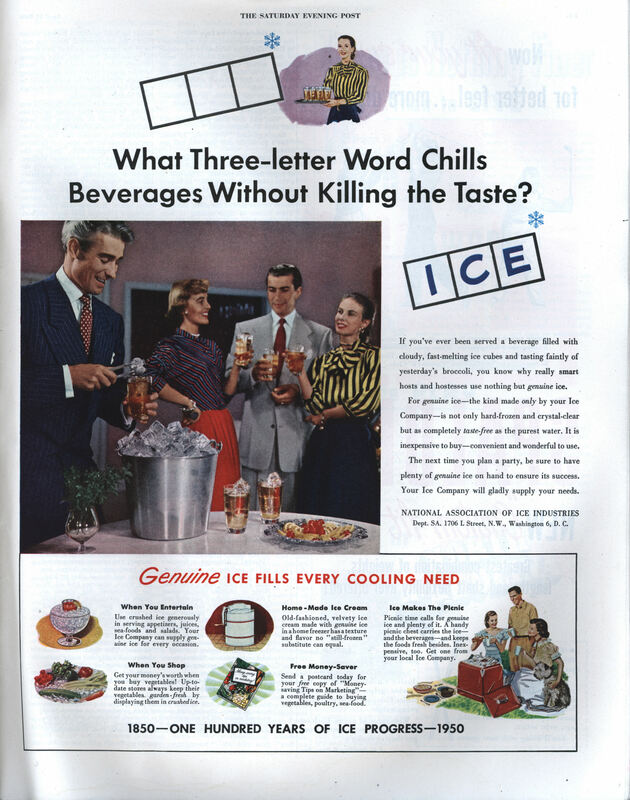 Ice companies were failing right and left in 1951 due to the growing popularity of the electric refrigerator, especially among young, upwardly mobile conservatives (ie. Post readers). This ad seems to be a last-ditch attempt to retain a sliver of their original market share. It might have worked better had the subtext been “your refrigerator can’t make enough ice for all the glamorous and exciting parties you hold, you devil you” rather than “you filthy slob, you can’t even keep your fridge clean enough to make ice that doesn’t stink”. I can’t remember ever seeing it advertised. I’m just glad that it is still readily available; our water supply makes ice smell like cat pee and taste like sulfur. Yes, even with filters. Wasn’t glacial ice from Greenland exported to some fancy nightclubs years ago, because high pressure gases trapped in it made it to “explode” when it melted in the drinks? Jari: In Bill Bryson’s recent book “At home : a short history of private life”, he says that ice from a particular lake in Massachusetts was so popular in England in Victorian times that a Norwegian town renamed itself to match, so as to sell “counterfeit” ice. I think it was Wenham Lake. Good thing that “mass-produced” ice never really went out of style, as it were; what with the unwholesome water that can be found in some areas, as Tom alluded to above. Fortunately, my local water is palatable, however it does have a high mineral content. We got a reverse-osmosis filter system, so now we can have good ice without having to buy it . . . .
Don: And putting all of those union Icemen out of work! Personally, I order my drinks without ice when I’m out. Actually by the 50’s ice harvested from lakes and rivers was a dead industry too, beaten out by industrial ice producing plants in the teens and twenties, basically glorified mammoth freezers. So there is a tad bit of irony in the fact that this advertisement is basically making the argument that you should buy ice from their freezer, rather than make your own. Toronto: For me, going to A&W means a transatlantic flight… And I have no idea how root beer tastes like, as it’s virtually unknown here in Finland. To the point, that for example Snoopy drinks ginger beer when Charlie Browns are translated. Another tidbit: At least In the Canary Islands, beer mugs are cooled in a freezer before serving a beer. Stays cooler much longer in that way.